The Meadowlark is a musical bird. Both the Eastern and Western varieties sing a number of songs. It is a truly beautifully colored bird, with a vibrant yellow breast, and intricate patterns of darker and lighter feathers. The Western Meadowlark has a very melodious song, and they sing anywhere from 13 to 20 different kinds of songs. The Eastern Meadowlark, while they look almost the same as the Western, has a higher pitched, thinner song, and is not quite as melodious. It makes up for that, though, with it’s sheer number of songs: 50 to 100 different distinct songs! Pictured here is a Western Meadowlark, initially hunting for seeds and insects among the fresh, deep blue-green grass and ground cover of spring. Lit by full sunlight, his brilliant colors and feather details are revealed. To add to his color, his beak is a slight blueish color on the underside. 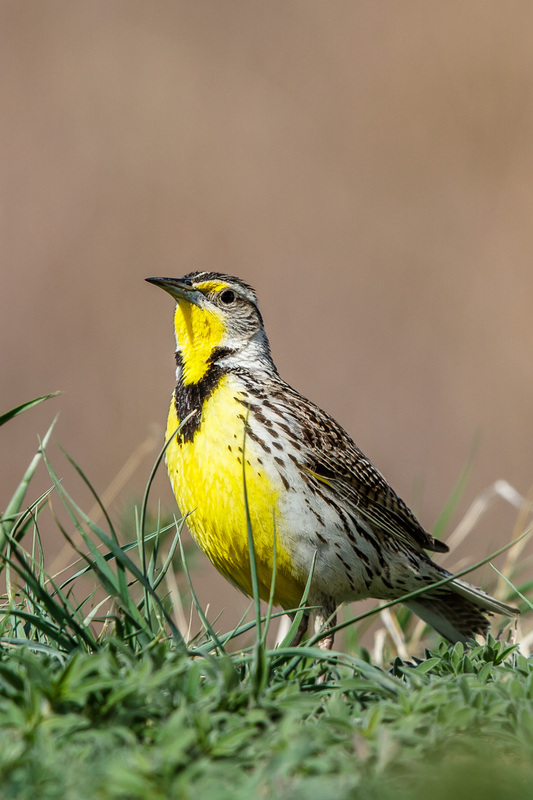 Once finished with his rooting for a meal, Meadowlarks tend to find a nice, high, isolated perch out in the open of a broad field, and they just let loose in song. Sin Duda Un Buen Objetivo Para Tanta Cercania, Muy Buen Enfoque y Precioso Colorido … Un Saludo. Wow, such clarity and details!